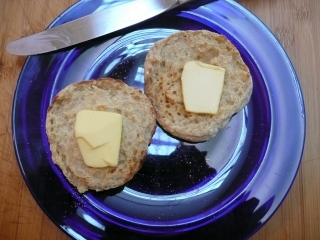 I was surfing around the Web last week and came across a picture of English muffins cooking in a cast iron skillet. I’m always interested in recipes that make special use of cast iron, and I didn’t realize until I saw this picture that English muffins were made in a skillet. I like English muffins and I’m getting a little tired of popovers for breakfast, so I thought I’d look up the recipe. Well, it turns out there are a million different recipes for English muffins, and they vary widely. Some are rolled out and cut like biscuits into circles. Some use a wet batter that is poured into crumpet rings. Some are baked in an oven rather than cooked on a skillet – either partially or completely. Some are cooked in a covered skillet (news flash: that is baking, not skillet cooking). Judging from reviewer comments, most of the recipes lacked the large holes and sourdough flavor characteristic of English muffins. A few tried to correct this problem by the addition of vinegar for the sour flavor, and baking soda just before cooking to create holes. That sounded like artifice to me so I continued my research, and eventually discovered the authentic source of that characteristic taste and texture. I tested my theory with a recipe of my own creation, and the result was fantastic. Here is my recipe – with pictures! Homemade English muffin with natural nooks and crannies. 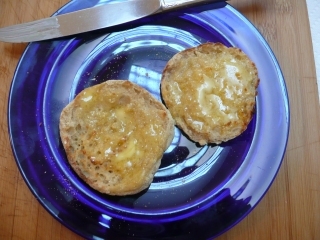 Homemade English muffin, nooks and crannies filled with butter. 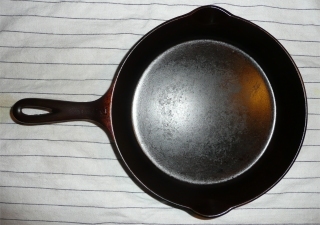 My previous post on the chemistry of cast iron seasoning focused on fat polymerization – the transformation of an oil into a hard, slick glaze. After I posted that, someone sent me some links that talked about two other elements in cast iron seasoning: carbon and magnetite. Carbon is the black stuff that’s left after something is burned. A certain amount of carbon gets bound up in the polymerized fat when food is cooked in the pan. This may darken the pan, but does it make it more nonstick? Some say it does, though I don’t see the mechanism. More interesting to me is the third element: magnetite. The post after this one on “black rust” describes why you should heat the pan before applying oil for seasoning. This helps the seasoning to adhere and makes the pan pleasantly black. 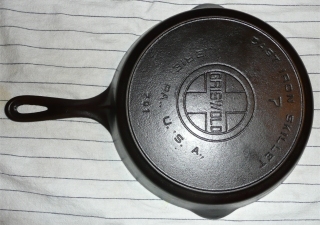 In a previous post, I illustrated how I cleaned and reseasoned an antique cast iron popover pan. This was my first attempt, and my seasoning technique was somewhat haphazard because I couldn’t find consistent, science-based advice. I used a combination of organic avocado oil and strained drippings from organic bacon. 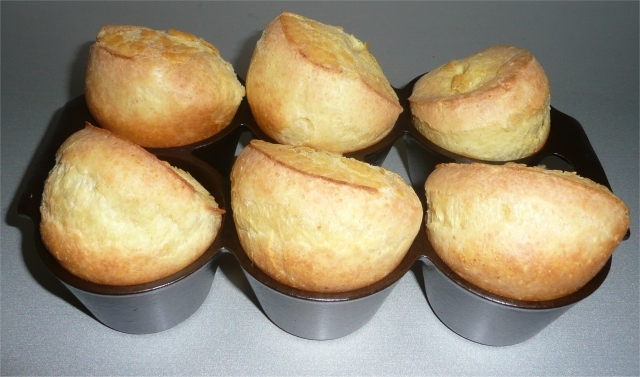 This worked pretty well on the popover pan, which doesn’t have a polished surface. But the smooth inner surface of a skillet showed an unevenness of color and texture, and the seasoning wasn’t hard enough. It was too easily marred by cooking utensils or scraping against oven racks. I wanted to understand the chemistry behind seasoning so I’d know how to fix this, but there is nothing that addresses this issue directly. A Web page on cast iron posted by someone similarly obsessed with the science gave me two crucial clues, the phrases “polymerized fat” and “drying oil”. From there I was able to find the relevant scientific literature and put the pieces together. The pictures below are both of the same antique cast iron skillet. The “before” close-up on the left is from a picture of the skillet in my previous blog post on making German Pancakes. I stripped the pan with oven cleaner and reseasoned it based on my new understanding. The “after” close-up on the right shows the result. I’ve been interested in recipes that use the skillet’s unique properties: nonstick, stove to oven, even heating, and good heat retention. 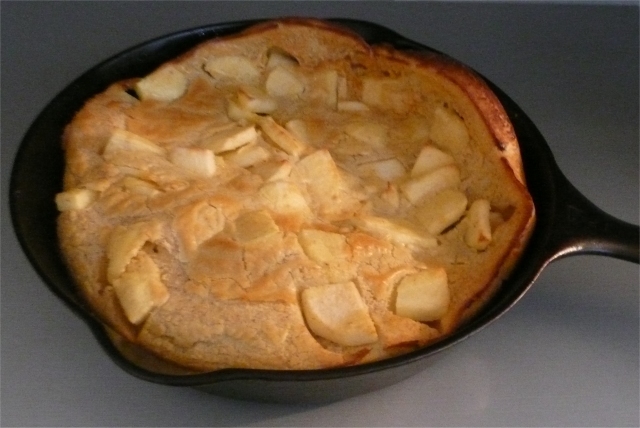 So I decided to make a German Pancake – also known as a Dutch Baby – stuffed with apples. I looked at several recipes and then came up with my own spin on it. I’d never had a German Pancake before so I didn’t know what to expect. I was amazed when I took my first bite. It was exquisitely delicious. Here’s the recipe.